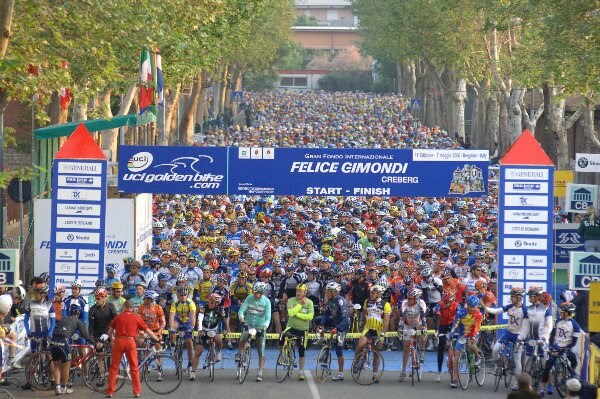 2Wheel Chick: Wanna do La Felice Gimondi? Well, it won't be until 2014, now. After 17 years of holding the event, the organisers are taking a break, but they hope to have a new improved event next year. While we wait till then, here are my quick facts on this enjoyable event which I rode in 2012. This is a big event on the Italian cyclosportive circuit, though with a field of around 3,500 riders it's not as big as other events like the La Pina or the Maratona dles Dolomiti. This means there is still a human dimension to the event. It has a local feel, and fortunately there are no bottlenecks on the road and no bun fights at the feed stations. The field is largely Italian, with a smattering of participants from other European countries (UK, Germany, France, Switzerland) and a handful of folks from further afield (Australia, USA). 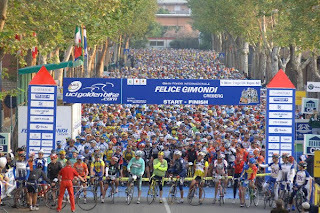 The ride starts from Bergamo at a large sports complex, not far from the city centre. There is usually a choice of 3 routes - 90km, 130km and 160km. However in 2012, when I rode it damaged road surfaces due to bad weather meant that the options were altered to 100km and 140km. The area is not so well known to people outside the Lombardy area, but the surrounding mountainous areas of the Valle Brembana, Valle Taleggio and Valle Imagna are beautiful. The climbs are not too challenging, with most climbs being less than 10km long and averaging 7%. The longer route includes a 20km climb but the gradient is very gentle. The early part of the route climbs up near Lake Iseo, and there are stunning views of this loose sigma-shaped water feature. The main route goes through the Valle Brembana - a loop around a very picturesque valley. 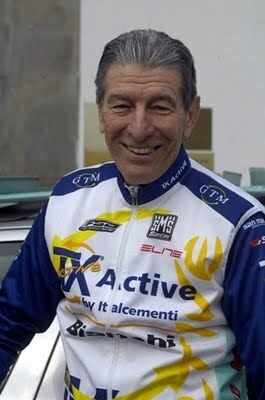 This ride aims to incorporate the areas that local boy-turned-national-hero Felice Gimondi trained on in his heyday. In fact, the great man himself, now aged 70 makes an appearance at the event. He is at the HQ the day before the event, and he sets off with the riders on the day. After the ride you can get showered and enjoy a hearty meal in pleasant surroundings while sharing stories with fellow participants, and making the most of the various sponsors' stands. I'd recommend this event mainly on account of the lovely landscape, and it's accessibility to new club riders. Also, it is possible to fly straight to Bergamo if you are coming from abroad. When I rode this event on 2012 the weather couldn't have been worse! It rained continuously the whole time, with moments when the rain was torrential. All those beautiful views I've described were invisible under the fog. (My descriptions are based on subsequent visits to the area during sunny days.) By the time I finished the cyclosportive I could barely feel my fingers and toes - even though it was May! I've been told that the weather is usually very pleasant, though this year, and in 2011 as well the weather didn't play ball. I hope the event does return in 2014, and I certainly plan to be on the start line with Mr Gimondi ready to enjoy a good day in the saddle with many others. 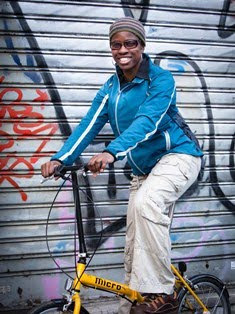 You can read more about the event in this article I wrote for Cycling Weekly. I always had this one down on my list but never got round to it. Some years it would be only a week before the Nove Colli, so these two would be a great pairing with a week's Italian holiday in-between. I hope they bring it back and keep it close to the Nove Colli, then I may well do a 10 day trip and use the good-value Italian train network to travel between the two. The story is it should be returning next year. I hope it does make a return as well.